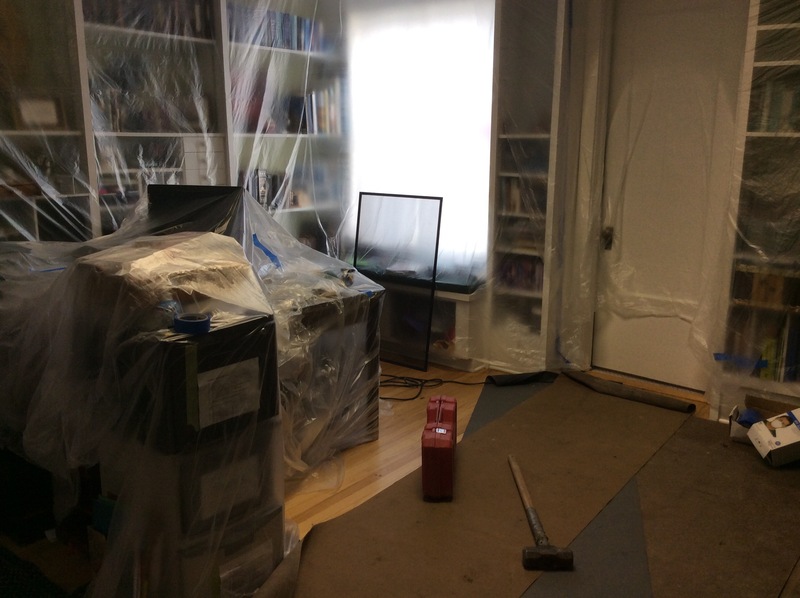 Somehow I had failed to appreciate the extent to which remodeling the bathroom next door would affect my office. See that black screen under the dust wrap? Yeah, that’s exactly what you think it is. Foolishly I had expected to be able to keep working while the bathroom was being redone. I am learning the hard way that I should have listened to Daddyo when he offered to move the computer to the dining room for the next four weeks. In the meantime, I guess we’ll find out whether this WordPress iPad app is any good. Fingers crossed. Didn’t have that problem but don’t mention IKEA. That’s what I spent the weekend doing, and though it was simple or should’ve been simple Tinkertoy stuff, that only works if the pieces aren’t warped…oh, and I didn’t have to custom re-fit everything due to our ceiling not being the right height. Oh, and trying to call the store and being put on hold for an hour with no response…twice. I won’t say what I really WAS saying on this site. Then again, I made it all work, even if it blew the entire weekend. I have built enough IKEA furniture myself to start factoring in the cost of hiring someone else to build it with every purchase. You have my sympathies (and admiration for actually sticking it out to completion).